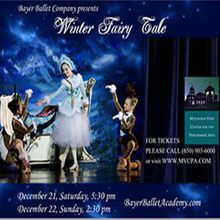 The Bayer Ballet Academy comes to Mountain View to present "A Winter Fairy Tale," back by popular demand. With exquisite dancing and gorgeous custom-made costumes, this production features a magician's magical book that brings to life a Russian New Year's Eve forest fairy tale, filled with sweet animals, animated toys, and other fairyland creatures. Perfect for the whole family!